SupplyCare provides a comprehensive and complete view of levels and product inventory in a company’s tanks and silos, all over the world. 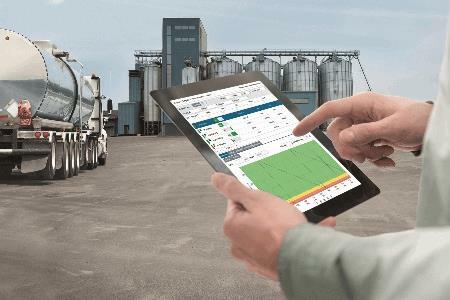 Endress+Hauser releases SupplyCare 3.0, an update to its IIoT application for tank inventory management. SupplyCare provides a complete overview of levels and product inventory in a company’s tanks and silos worldwide. Enhancements in SupplyCare 3.0 include hardware and software options allowing level, flow and pressure data to be displayed at a desk or handheld device regardless of location—and advanced inventory tools for forecasting, reporting, stock analysis and other functions. SupplyCare Enterprise runs by default in an Apache Tomcat-environment on an application server as a service under Microsoft Windows. Operators and administrators access the application via a web browser from their desks or handheld devices such as smartphones and tablets. SupplyCare can create reports in various formats including Excel, PDF, CSV and XML. Data can be easily shared with and used by other systems and computing platforms. SupplyCare 3.0 receives data from local I/O at a company’s tank farms and refineries; from third-party platforms such as control systems, data historians and ERP systems via OPC DA technology; and from email servers at gateways. This allows a company to monitor tank levels and inventories worldwide to help manage its entire operation. For example, SupplyCare 3.0 detects events such as falling below safety stocks or plan points, and sends e-mails to predetermined users. Whenever there is a technical problem, such as a connection failure, SupplyCare sends alarm messages and e-mails to the system administrator and designated contacts. The system can receive measured values from two redundant data sources. In case of failure of the primary data source, the system switches automatically to the secondary data source. Enhancements in SupplyCare 3.0 include SupplyCare Hosting SCH30 and Enterprise SCE30B software that provide inventory visualization, forecasting and reporting tools, stock analysis and reconciliation between plants, planning and scheduling inventory transfers, monitoring of alarms and events, and visualization of sites and stocks on a geographical map. New IMS SXS70 Middleware enables the integration of SupplyCare data with ERP or MES systems. The middleware has four workflow modules that use standard data formats and connectivity methods such as XML, JSON, REST and SOAP. The middleware can connect directly to a company’s ERP system, or send data to customers or other parties via the internet. New hardware enhancements include Fieldgate FXA42, a gateway that acquires data from local level, flow and pressure instruments; sends it to the local control system; and transmits it to SupplyCare via an integrated web server. Also new is the Connect Sensor FXA30, a battery-powered cellular gateway for remote monitoring of level, flow and pressure instruments in locations where power is not available. It transmits data to SupplyCare via a wireless cellular phone connection.